If you're starting to feel homesick, definitely give this place a try. The restaurant is closest to Sangsu Station on Line 3. We walked over from our Airbnb in Hongdae, and it was maybe a 30 minute walk. It's around the corner from Milky Bee. The owner also happens to be from Brooklyn, NY. He was really nice and even gave us a few more non-Korean restaurant suggestions to try out. Gustos Tacos has a variety of tacos to chose from on the menu, along with Jarritos, the well-known glass bottle of Mexican soda you can find at a regular taco joint back in the States. We ordered the first two taco options on the menu (Chipotle Pork and Flaming Chicken). Each one was 7,000 won and came with 2 tacos. I personally preferred the Chipotle Pork Taco. The flavor was incredible. And I would quote the owner, "Forget the Instagram nonsense." 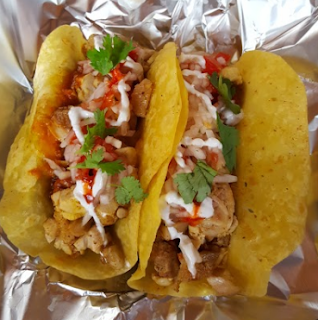 These tacos are definitely meant to be eaten right away because everything here is made from scratch, so there's no preservatives that keep the taco consistent even after 10 minutes of nailing that Instagram-worthy food shot. Do keep in mind, not to wear a white t-shirt, because it can get messy. 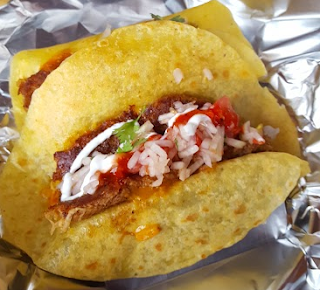 The pork is perfectly juicy and as you're eating, the juices will drip off the other end of the taco when you are least aware. The chicken taco was really good too, the salsa was good, but it just didn't have the same flavor bomb impact as the first taco. Now I know, save the best taco for last. ;) If they turned this joint into a Chipotle-style joint, I definitely wouldn't mind paying extra for more meat! Next up, is Milky Bee. The pretty rose shaped ice cream cone was hard to resist after an extremely satisfying late lunch. 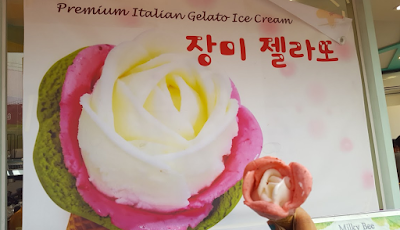 The rose ice cream is similar to Amorino's Gelato chain in the States, where the ice cream is shaped into petals. The only difference is there is a very limited selection of flavors--there was only strawberry, original (tasted kind of like vanilla yogurt), green tea, and chocolate. The basic rose ice cream with only strawberry and the original flavor cost 4,500 won and there is an additional cost for more layers. The ice cream itself was alright, the strawberry ice cream was better than I expected. There were tiny bits of strawberries in the ice cream that gave it a nice texture and gave it a more realistic strawberry flavor rather than the typical artificial strawberry flavoring. They also offer a stamp collection card where you can get a free cone for every 10 cones you buy, but I'm not willing to spend that much just for a free cone. Maybe if they expanded the selection of flavors instead of sticking to the "rose" color scheme.